WUHAN, Jan. 9 (ChinaMil) -- “In the eyes of many foreign military cadets, due to their lack of understanding of the country, China remains backwards,” said Weng Tianhao, a cadet from the Naval University of Engineering of the Chinese People’s Liberation Army (PLA), when he shared with classmates his stories of spending three months on the Romanian Navy's sail training ship “Mircea” for an oceangoing visit mission to seven countries on the New Year's Day of 2018. “After we introduced China’s ‘four new inventions’ to them, namely the high speed rails, Alipay wallet, bike-sharing and online shopping, none of them asked the questions about China’s urban and rural development anymore,” added Weng. 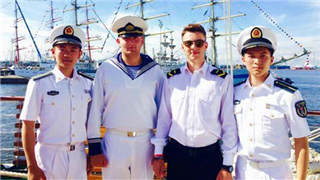 Weng Tianhao and his classmate Qin Haochen returned to their university after concluding the oceangoing visit mission with Romanian Navy sail training ship “Mircea” on Sept 25, 2017. During their three-month-long voyage covering nearly 10,000 nautical miles, they visited eight ports in Spain, Sweden, Finland, Poland, Germany, Portugal and Greece. They learned the basic training subjects of the sail training ship, attended foreign affairs activities and forged profound friendship with foreign navy cadets. They also demonstrated the open, confident, friendly and enterprising spirit of Chinese young military cadets. The Romanian navy has 20,800 soldiers, with one Fleet, one River Flotilla, and one Marine Corps. Since Chinese Navy's guided-missile frigate Yantai's first visit to Constanta of Romania in 2012, the exchanges between the two navies have gotten increasingly closer. 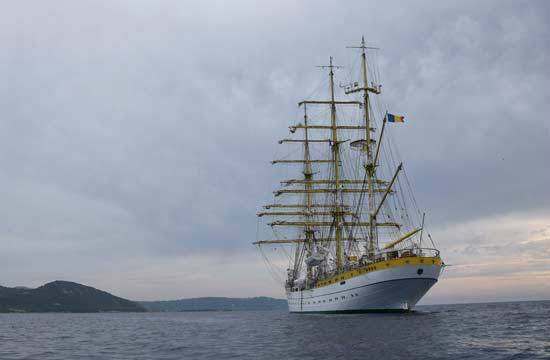 The training is an annual sailing internship program for Romanian naval officers and non-commissioned officers. Each year, the Romanian navy invites several countries to send two naval cadets each to participate in the training. The countries invited by the Romanian side in 2017 are Poland, Bulgaria, Greece and China. The ship "Mircea" is an antique sail training ship built in 1939 by a shipyard in Hamburg, Germany. With a displacement of 1,630 tonnes, a hull length of 81.3 meters, a width of 12.5 meters and a mast of 44 meters, the ship has five boom levels. Weng Tianhao and Qin Haochen were very surprised when they saw the training ship made during the World War II is still in service. Captain Moise of the sail training ship “Mircea” told them that although the ship is old, but it provides a good training platform for cadets to learn the most primitive sailor work during sea voyages, such as how to track the movements of stars, study hydrology, climb the mast, do the canvas and rope work, tie knots and other seamanship, as well as experience the meteorological, hydrological, tidal and ocean current impacts on maritime military operations. "In information-based warfare, these skills will come in handy when equipment such as advanced navigational systems on a warship gets destroyed by the enemy," said Captain Moise. Soon, Weng Tianhao, who once aboard on Chinese destroyer, felt the difference between a combat ship and a sail training ship. On a destroyer, sailors need to maintain their weapons on a daily basis, but the sail training ship carries no weapons. The most frequent training subjects on the ship "Mircea" were "tying rope knots", using sextants and other basic navigation training subjects. In addition, cleaning the deck was also a daily routine. Since the floor of the sail training ship is made of wood, easy for the surface to go black, cadets had to kneel on the deck every day cleaning the floor with sandpaper to keep the deck clean and tidy. Most of the work on the sail training ship required a lot of people to complete, such as hoisting a sail, shortening a sail, and paddling. Hoisting a sail involved complicated procedures. The ship was densely equipped with all types of ropes so everyone was required to "pinpoint" the rope that he or she was responsible for and it required for each individual to properly do their job for the entire ship to function like a precision instrument. After the mast rose to a certain height, the squad leader would make an order, and all the people would turn backwards, tightening the ropes like in a tug of war and making a firm stand to prevent the just-raised sail from suddenly descending and causing a safety accident. When the rope ends were fast fixed, the squad leader then made another order for everyone to drop the rope at the same time. The process seemed easy, but it tested the tacit cooperation between cadets from different countries. If someone got distracted and failed to hear the order clearly, the entire process would slow down. The countless times of cooperation between all cadets and crew members secured the successful sailing of the ship "Mircea" time after time. During the three-month-long voyage, the two Chinese naval cadets attained a deeper understanding of the phrase "weathering the storm together on the same boat". Naval cadets from multiple countries lived and received training on one ship, and different cultures also collided with each other on the ship. August 1, 2017 marks the 90th anniversary of the founding of the PLA. 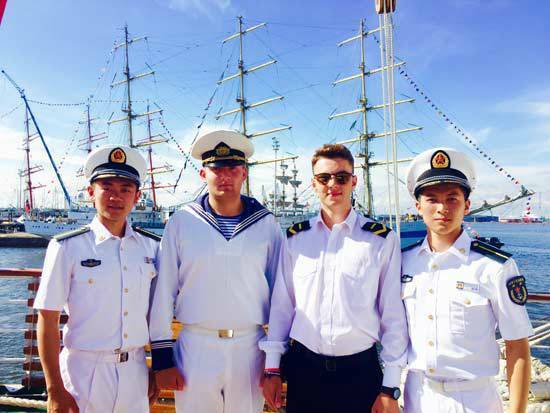 During the muster on the afternoon of the day, vice captain of the ship "Mircea" introduced everyone that the day is the birthday of the Chinese People's Liberation Army (PLA). In a split second, Weng Tianyao and Qin Haochen were surrounded by felicitation of "happy birthday", and everyone came over to greet them with warm hugs. Weng Tianhao then took the opportunity to deliver a speech entitled "Strengthening China-EU Cooperation and Maintaining World Peace", and played videos of the PLA conscription and the PLA Navy’s ocean training. In the videos, the neatly-lined arrays, daring spirit and new equipment of PLA soldiers impressed foreign military cadets and updated their understanding of Chinese Navy. "I knew that China had a huge army, but I did not know that their equipment was also so advanced," said Hegiu, a Romanian naval cadet. "We are proud of being Chinese naval sailors," said Weng Tianhao. On the ship “Mircea”, the two Chinese cadets showed their confidence and calmness. They are like two name cards sailing on the ocean, showcasing the ideas and features of Chinese Navy and the distinctive style of Chinese naval cadets on the voyage through wind and waves.